RC lines are a study in creased, swoopy sheetmetal. 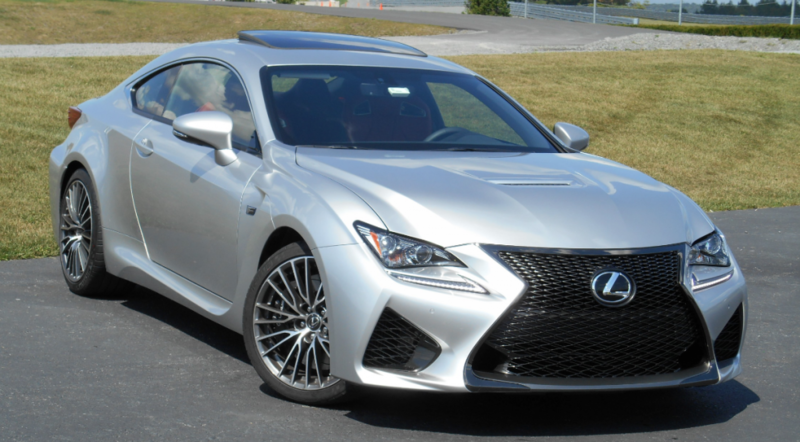 The RC 350 (shown) and more powerful RC F are distinquished in appearance by different grille treatments and various scoops. Only the RC 350 is available with AWD in place of rear-wheel drive. Lexus entered the luxo-coupe market for 1991 with the SC 300/400, a stunning 2-door based on the big LS 400 luxury sedan introduced the year before. While the sedan was always the main attraction – and what put Lexus on the luxury-car map – the coupe has become a classic whose flowing, “bar of soap” lines still look remarkably good today. “Flaxen” is one of three two-tone interior color choices; one can also get all black. For 2015, the new IS sedan will spawn a 2-door companion, though it will arrive as a conventional coupe – with a new name. Christened RC, it will be offered in “luxury” RC 350 guise along with a performance-oriented RC F version boasting V8 power – something the latest convertible never had. Lexus says the platform is actually a combination of parts from the current IS sedan, IS C hardtop-convertible, and midsize GS sedan. The RC 350 is due to go on sale in early November, 2014, at a starting price of about $43,000 – roughly $3000 more than the IS 350 sedan. The V8-powered RC F is expected to arrive shortly thereafter at a starting price of about $63,000. Lexus says loaded versions will add about $7000 to those figures. The RC 350 is offered in both rear- and all-wheel-drive form, the latter being a first for a 2-door Lexus. The RC F is rear-drive only. 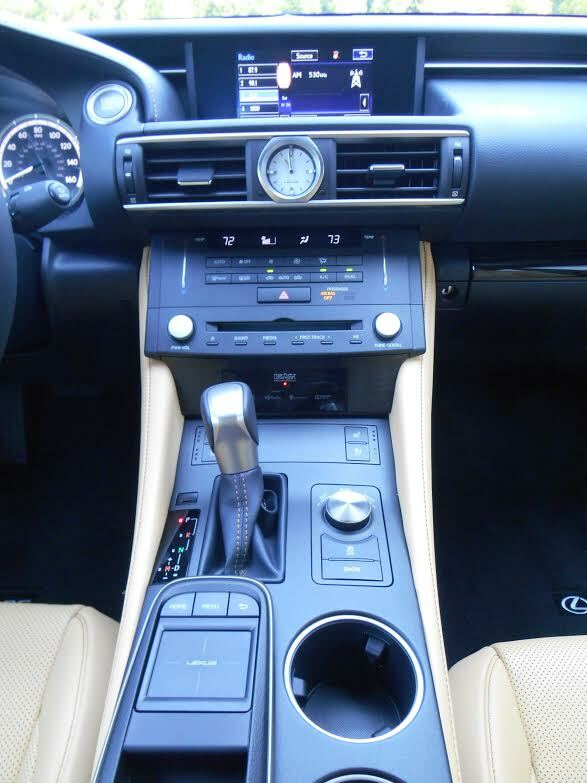 Touchpad (behind shifter) replaces the “mouse” used in most other Lexus models. It works with motions similar to those used on a smartphone screen. The RC’s most notable competitor is probably the BMW 4-Series (nee 3-Series Coupe), which is offered as the 428 with 240-hp 4-cylinder turbo ($40,600), the 435 with a 300-horsepower inline-6 turbo ($46,100), and the M4 with a 425-horsepower inline-6 turbo ($64,200). As such, the RC 350 falls between the lower-line models in price, while the RC F essentially goes head-to-head with the M4. Although RC styling clearly follows the IS’s lead, few exterior pieces are shared. What the RC more closely resembles is the LF-LC concept coupe introduced at the 2012 North American International Auto Show in Detroit, and – even more closely – the LF-CC introduced later that year in Paris. Crisp creases accent the fastback profile, and the front end wears what has become Lexus’s trademark “spindle” grille. It’s inside where the RC and IS are most alike. Dashboards are essentially shared, though the instrument panel of the RC boasts two round, side-by-side gauges in place of the IS’s main center-mounted gauge. Consoles differ mostly in that the RC uses a touchpad in lieu of the IS’s traditional Lexus “mouse” to facilitate infotainment adjustments. Under the hood, the RC 350 hosts a 3.5-liter V6 rated at 306 horsepower. In rear-drive versions, it’s mated to an 8-speed automatic transmission; those with all-wheel drive get a 6-speed. EPA ratings are 19 city/28 highway with RWD, 19/26 with AWD. Premium fuel is required. A significant power boost is supplied by the RC F’s 5.0-liter V8, rated at a prodigious 467 horsepower. The 8-speed automatic drives the rear wheels through a Torsen limited-slip axle with optional torque-vectoring capability. Although official figures have not yet been announced by the EPA, Lexus estimates that the mpg rating will be 16 city/25 highway, and as might be expected, premium fuel is required. As a premium sporty coupe, the RC 350 comes with most expected luxury and convenience items, but many buyers will probably add at least some options. Standard features include keyless access and starting, rear-obstacle detection, Lexus Enform Remote (which allows remote viewing and control of some functions), and Siri Eyes Free (voice recognition and hands-free text messaging). Options include leather upholstery (“NuLuxe” vinyl is standard), navigation system, rearview camera, heated and ventilated front seats, heated steering wheel, blind-spot and rear cross-traffic alert, and memory driver seat. Also optional is Lexus Enform App Suite, which includes apps such as Pandora, Bing, Yelp, and iHeartRadio. 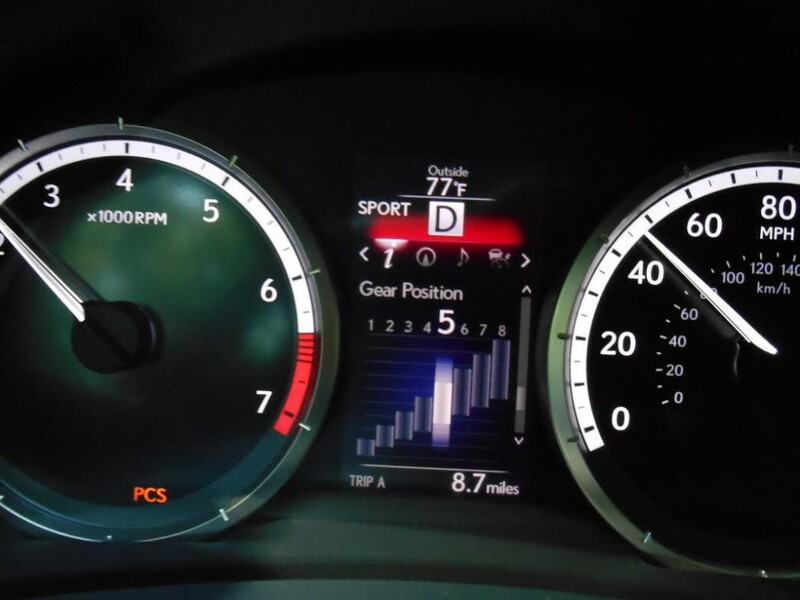 Between the gauges is a neat bar-graph gear indicator that’s as useful as it is entertaining, particularly when utilizing the paddle shifters. A performance “step up” is the RC 350 F Sport. Added in that model are adaptive variable suspension and rear-wheel steering (both aimed at improved handling), along with unique interior and exterior trim. Both the RC 350 and RC 350 F Sport are offered in all-wheel-drive versions, but in that form, the latter model forfeits its rear-wheel steering. Although adults up to about 5’9 could squeeze into the back seat (the front seat powers forward to reveal a decent opening, but it does so very slowly – and returns at the same pace), they won’t have sufficient legroom unless the person in front of them is not much taller than that. Storage space is likewise limited. While Lexus says that the trunk will hold two sets of golf clubs in a wide channel at the rear, at 10.4 cubic feet, volume is moderate at best, though about average for a coupe in this class. Cargo space can be expanded by folding the rear seat backs, but doing so leaves about a 6-inch-high “step,” so large boxes can’t just be slid forward; as such, it’s really more useful for long, light items such as skis. 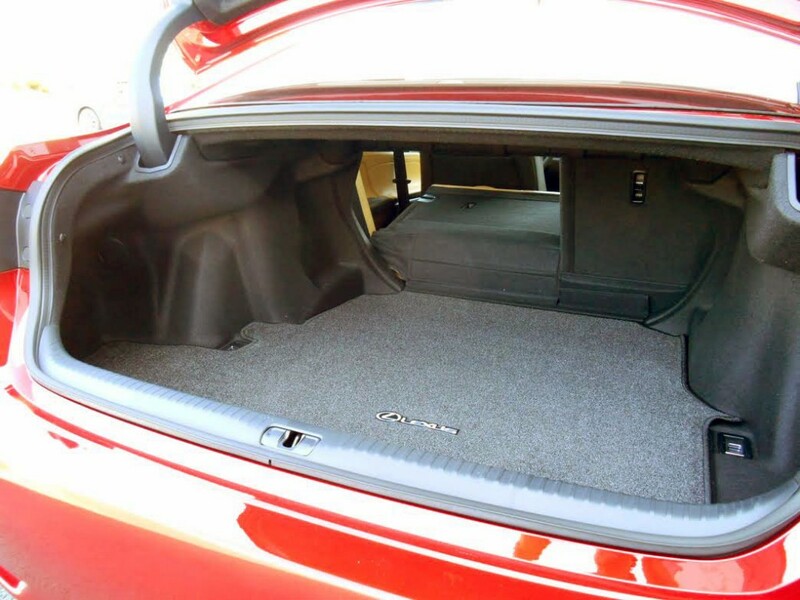 By the same token, interior storage is somewhat meager, with just a decent-sized 2-tiered glovebox, a smallish console box with Aux, 12-volt, and dual USB plugs, and narrow map pockets in the doors. But none of these “packaging” issues are really the point. Lexus states that the RC is intended as a high-performance luxury coupe for two, and in that role, it fares very well. The 10.4 cubic-foot trunk will hold two golf bags or a fair amount of luggage. Rear seat backs fold to expand the space, but they rest several inches above the level of the cargo floor. Up front, there’s plenty of head and leg room even for taller folks. Visibility is fairly good to the front and sides, but it’s downright poor to the rear corners; oddly a rearview camera is optional – not standard – though rear-obstacle detection is included in the base price. Vehicles driven at the press preview all had the optional navigation system, so some observations about the controls may not hold for those without it. For all practical purposes, the dashboard (save for the instruments) is straight out of the new-for-2014 IS sedan. All audio and climate controls are within easy reach. The audio includes knobs for volume and tuning, with station selection done through the screen via a console controller – which we’ll get to in a moment. Climate controls aren’t as straightforward. Temperature is adjusted with a vertical, touch-sensitive slide switch, with mode and fan speed set through repetitive-step pushbuttons – none of which are as quick or easy to use as good ‘ol knobs. While the IS sedan’s console controller is the same type of haptic-feedback “mouse” used in most other Lexus vehicles, the RC coupes we drove used a higher-tech touchpad that functions much like a smartphone screen. Trouble is, both controllers suffer the same problem: that being the difficulty in guiding the pointer to the right place on the screen without a long look from the road. Part of the problem is that the pointer movement lags behind your finger movement, so you often overshoot the mark you wanted to hit. Granted, the screen is mounted high on the dash where it’s close to your line of sight, but most touchscreens typically make these adjustments much easier. As might be expected, this same touchpad is used to control navigation and phone functions. 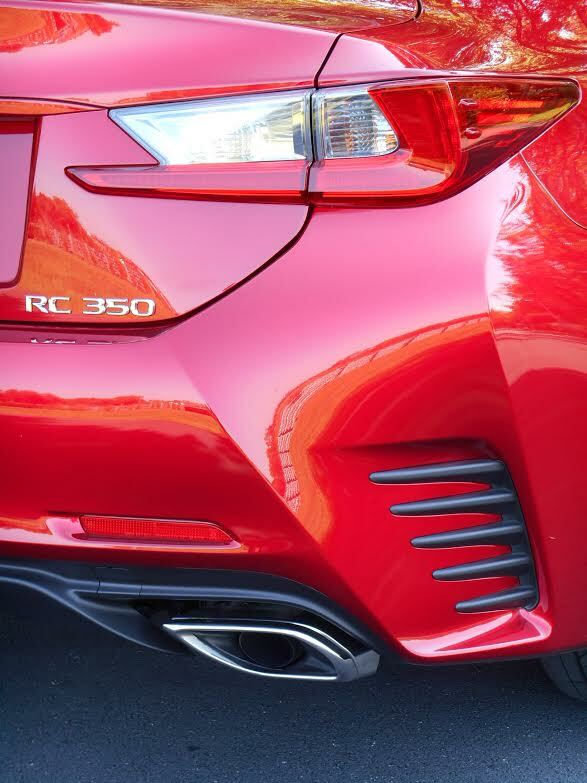 The RC 350’s tail treatment may look sportier than the RC F’s, but the latter wears wider rear fenders. Both continue the “creased” theme seen up front. 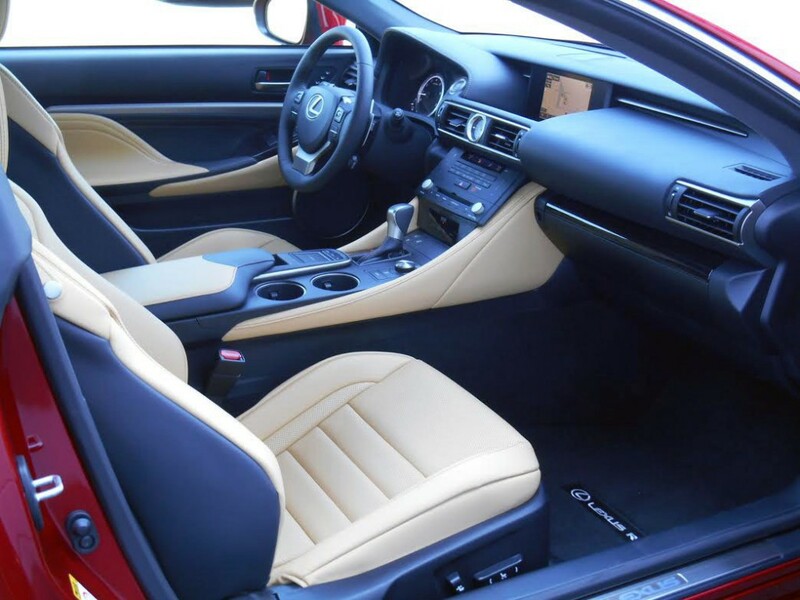 Interior materials are what would be expected of a car in this price class – most surfaces being padded, though some rather thinly – but color selection isn’t. There are four interior hues offered (all with a black dashboard), with F Sport models available in distinctive red. The buyer can also choose between three trim finishes. So that’s the static segment of the review. Now for the fun part. And “fun” we indeed had. Lexus spent much of its presentation time (and 53 pages of press-kit info) on stressing the performance focus of the RC with phrases such as “track-ready product” and “built to thrill.” And then they put us on a racetrack to judge it for ourselves. While this is a great way to assess the car’s ultimate performance limits (though you really don’t want to be the one who finds those limits by crossing them), and it did showcase the car’s capabilities – which are considerable – the road drive was perhaps more indicative of what the typical buyer would regularly encounter. 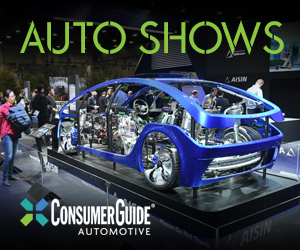 While there was no rough pavement to be found on the route (as there most certainly would be around our Chicagoland office), Lexus seems to have kept in mind that this is, after all, a Lexus, as nothing traveled over caused much of a disturbance. Corners brought on little in the way of lean, and the steering was quick to respond to inputs. The RC comes with three drive modes: Normal, Sport, and Eco. These alter throttle response and power-steering assist. In Sport, the steering is a little “heavier” and the throttle a little more responsive, but the change – while noticeable — is fairly subtle. F Sport adds a Sport S+ mode. This alters the variable suspension if the car is so equipped. On the roads we traveled, it produced a slightly firmer ride, but it wasn’t a night-and-day alteration. Power delivery from the 3.5-liter V6 is certainly strong enough, but the car doesn’t catapult off the line when the throttle is mashed; rather, it moves off in a somewhat “gentlemanly” manner, then builds speed as revs rise, with a noticeable surge as the engine passes its 4800-rpm torque peak and approaches its 6400-rpm horsepower peak. Even turning off the traction control didn’t prompt a chirp from the rear tires on takeoff. Lexus says a sprint to 60 mph takes 5.8 seconds (6.0 with AWD), which is believable, but though quick enough for the class – and probably most tastes – it’s hardly stunning. 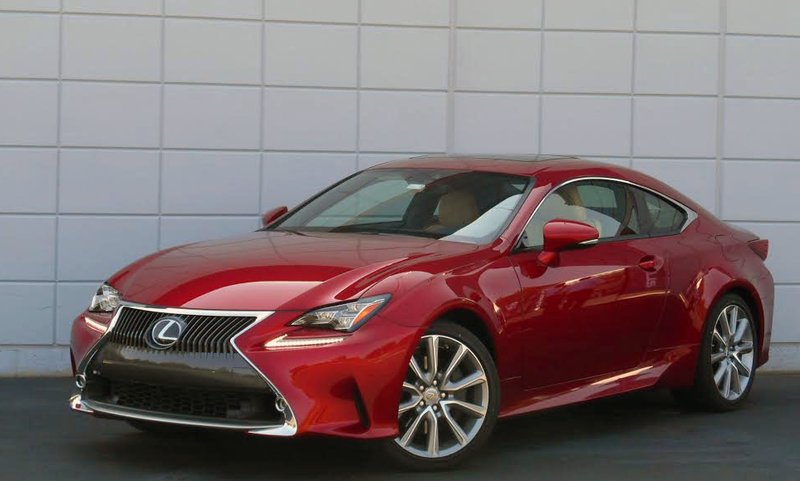 Compared to the RC 350, the RC F ups the horsepower ante by 161, and the sticker price by $20,000. A really strong point in the car’s favor, however, is its automatic transmission. Like previous ones tested in the IS, the 8-speed unit kicks down with lightning speed when the throttle is stabbed, resulting in an instantly – and impressively – strong surge. Ditto for the 6-speed in AWD models. Standard steering-wheel paddle shifters allow the driver to do that manually, but there are few times they’ll probably feel the need – especially since the drop from 8th (cruising) to 2nd (corner carving) requires six flips of the paddle. A neat graph in the instrument panel lets the driver know the currently selected gear. 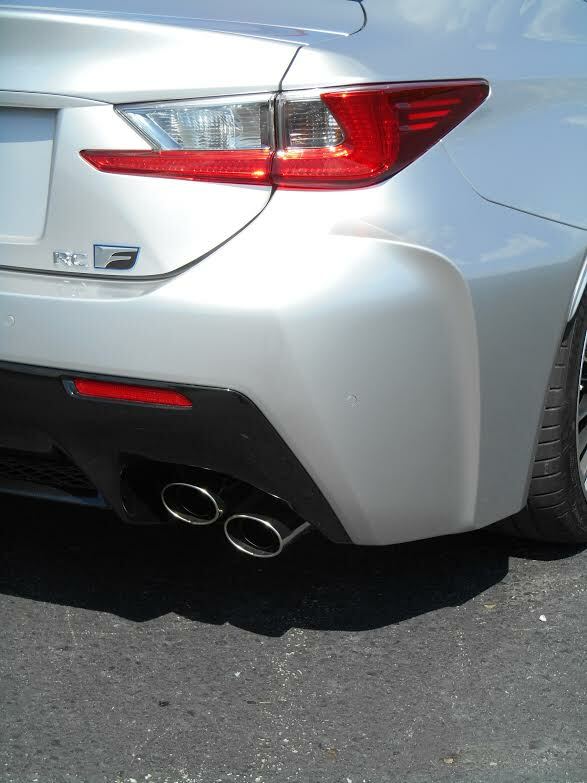 Though more subtly detailed, the RC F sports a wider rear treament that gives the coupe a more aggressive stance. Maybe it’s all part of an attempt to make the RC a gentleman’s hot rod, as frankly would befit a Lexus. 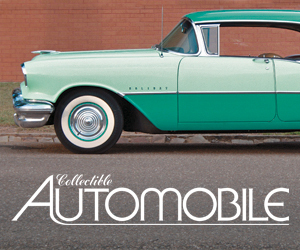 Even though the RC’s creased, flowing form is in sharp contrast to the melted edges of the original SC, perhaps that car set a precedent – and a standard — that the RC’s engineers used as fitting inspiration. Written by: Rick Cotta on October 13, 2014.on July 2, 2018.